I also observed an fMRI study on the neural substrates of semantic composition using noun-noun word pairs. If you heard the term “robin hawk” would you think of a bird that had traits of a robin and a hawk, or of a hawk that hunts robins? These were the kinds of questions that participants would think about while their brains were scanned to understand the brain regions associated with this type of thinking. I learned about code switching—a phenomenon that bilinguals exhibit as they comfortably switch languages mid conversation or even mid sentence. This is linked to cognitive control and the left inferior frontal gyrus—code switchers who have less cognitive control may be able to switch more fluidly/correctly. 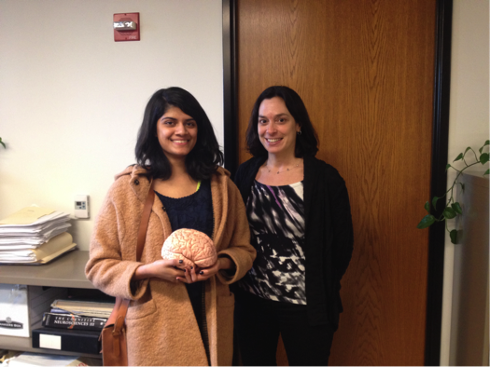 Externing at the Center for Cognitive Neuroscience taught me a lot about exciting topics in neuroscience and the environment of a cognitive neuroscience research lab. I got valuable advice about a career in research and had a very educational, rewarding experience. Exploring Philadelphia’s streets, restaurants, and museums in our downtime was pretty great too!